Sleeve designed by Andrew Biscomb & Peter Barrett. I only picked this record up a couple of years ago, along with a couple of other Suede 12″s, from an Oxfam shop. I recall though, way back around the time this came out, thinking what a nice sleeve design it was – very simple, very effective, and with a vague bit of thought behind the imagery. This was somewhat out of kilter with many ‘indie’ record sleeves at the time, which would often focus more on either trying to make unhip band members look hip, or going down the ‘pure abstract’ route. Looking up Biscomb & Barrett on the internet now, I see that they designed sleeves for a variety of other artists too – Luke Haines, The Auteurs, and (horror of horrors) Simply Red amongst them. Quite an odd selection of clients! 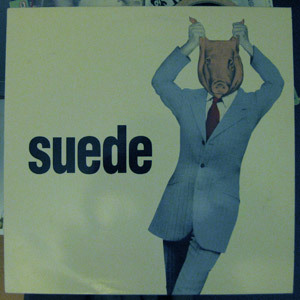 Back at the time of the record’s release, along with other Suede 12″s – a flurry were released within a couple of months, as far as I remember – I recall this and a couple of other Suede sleeves hanging on the wall of a room in the house of a chap called Jigger. Well, that wasn’t his real name, but I can’t actually remember his real name. His was a house of choice of post-pub shenanigans – smoking, drinking, chatting, etc. I thought the sleeves looked cool up on his wall. I’m not going to put my Suede sleeves up on a wall – too much collector/catalogue-r mentality going on in my mind for that. It could have been Jimmy Saville. I would’ve heard the jangling jewellery if it’d been J. Saville. Records, design and thoughts. Simon Minter is a freelance designer from Oxford, UK.